Hello everyone! I have noticed that there are a lot of discussions on the forum about how to make a choke point. But there are very few regarding how to break them. So I am starting this discussion to let you give your opinion on what strategies you generally use to break a choke point. I myself use an ice wall and a protector to hold a choke, and then shurikens to take the adjacent nodes. Obviously, this is a very novice method, and I am sure higher level players use different techniques. So I hope you ( higher level players ) will share your knowledge with noobs like me. PS : If you don't know what a choke point is, go and read the wiki first. So nobody's going to make a serious reply? tl;dr: Keeps Walls at low level and upgrade either your Protector or your Shocker. Use up to 3 Walls to install a Protector. Don't use Shocker and Protector on the same node. Using high level walls as your main defensive program is so cost-inefficient it's hard to make a profit. Defensively, there are two viable strategies for breaking a choke point or progressing through a Maelstrom: Protectors or Shockers. Shockers are better for "going fast" and dealing with Turrets or Black Ice that would smash through a Protector, while Protectors are better when you need to hold a node for a long time to get through a triple Guardian Core or Code Gate. Both programs are useless if you don't upgrade them properly. Initially you should focus on upgrading one or the other to keep your level low, but later you can upgrade the second program to tackle each part of a network with the most optimal program (and thus reduce your overall compile cost and compile time). Yopee: Wall8 has like 900 buffer right? Protector's buffer-to-space ratio becomes better than Ice Walls by level 13, and is far superior by level 21 (not that you'll ever need Protector 21). And library space is cheap. By level 30 you should have more library space than is needed to hack a single target. Again, this ratio favors Protectors even more heavily as you continue to upgrade them. Plus Protectors regenerate 7% of their maximum buffer every second, so a level 10 Protector regenerates fast enough to completely negate damage from a level 14 Sentry in a Scanner choke point. An adequately upgraded protector will not break under mere AV (food for thought next time you see a Maelstroms where the Sentry is the only thing they've upgraded). DaCoder: Why? Compile time waste? You also shouldn't use Shockers to "let a Protector regenerate some health." It's cheaper, the compile time is better, and you get more buffer by just installing a second Protector before the first breaks. Which brings us to Shocker advice. The first thing you have to understand is Shocker is worthless at low levels. You need to get it up to level 7 or so before it starts being useful. Shocker has two things going for it: It completely negates incoming damage regardless of a node's level, and it deletes itself after installation, freeing up one slot for more programs to be installed. Shocker, then 3 Beams is 50% more damage per second than Protector and 2 Beams. Shocker's upside and downside it lasts a specific amount of time. 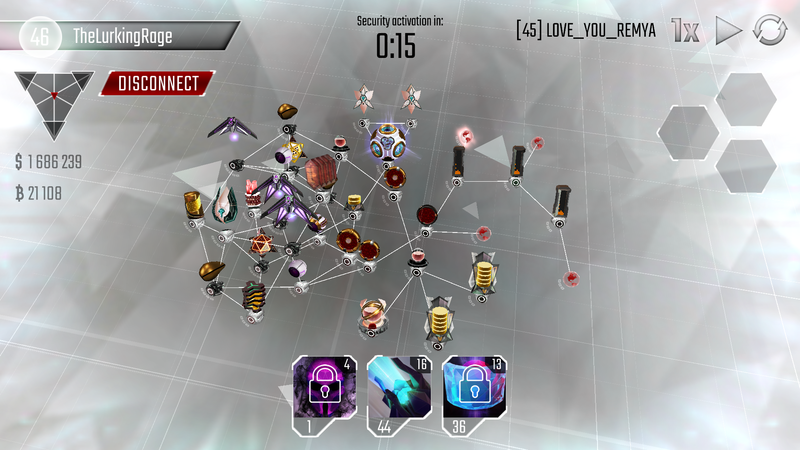 While a Protector may break under the combined fire of several well upgraded nodes in a Guardian choke point, Shocker prevents them from doing any damage at all. But on the other hand, a stall point like a triple Guardian Core may require more time to break than one Shocker can provide (even with that 50% higher DPS) while a single Protector wouldn't even break a sweat. You might think Shocker requiring 6 library space is a downside compared to Protector's 4, but you often need more than one (low-level) Ice Wall to install a Protector, so they even out. Compile cost and compile time are Shocker's last downside. You don't want to be spamming them too much. A Shocker main is punished more heavily than a Protector Main if they need to install a second or third program on a node and it ends up being overkill. Last edited by Hell_Diguner on Sun Dec 31, 2017 12:43 pm, edited 10 times in total. Looks like no one is interested. Forum has been extremely quiet since a few days, so I am not too surprised. TheLurkingRage wrote: No relevant quote. Improvise. Adapt. Overcome. Lurk probably missed this one. He's normally good with advice. Thanks! Now he will find this no doubt. I've seen people using a shocker and shurrikens. The shocker disables the adjacent nodes. I've uses a protector and 2 blaster. The blasters disable one node. I guess nobody is answering this because the question is too open-ended. There are many different kinds of choke points and the surrounding network also effects what the most optimal way to break a particular choke will be. Plus you might not have upgraded the right programs to break the choke in the most optimal way, or perhaps you pre-compile a different set of programs that work on most bases and you don't want to wait for the most optimal programs to compile. You'll probably generate more discussion by posting specific networks with one or two choke points that give you trouble. Second, I am personally facing no problems right now with choke points, since I am only using stealth to loot resources. I actually made this thread on behalf of those people who are really facing trouble breaking choke points, or will face this trouble in the future. However, keeping your points in mind, I will restate the question. Type 1: all black ice, protected by three guardians each - this has really high DPS, and is also very difficult to break. But it is slow. Type 2: all turrets - this one is really quick, and if you are not fast enough with your ice wall/shocker, it will be impossible to take. Three level 21 turrets will take a level 1 scanner within 0.9 seconds. Type 3: black ice and 2 turrets combo - the best one. It has both high DPS and high speed. And if you protect your black ice with three guardians, it can be very difficult to break. Assume that the choke point is a level 1 scanner in each case and all defence nodes are level 21(including sentry). How will you go about hacking each of these? Answers suggesting a way for any one case are also welcome.